Hi, my name is Jane and I am addicted to bread. Of all kinds. 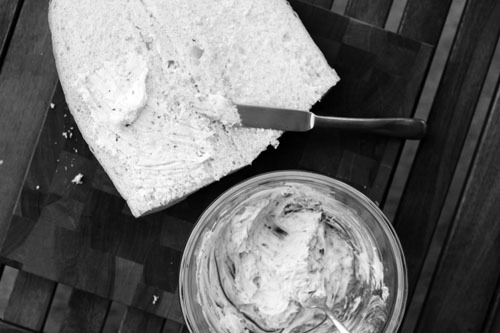 Especially buttery bread with garlic. Sunday night I made a simple dinner of pasta with sausage and crudite. I decided I needed to make a little something special to add to our boring simple fare. 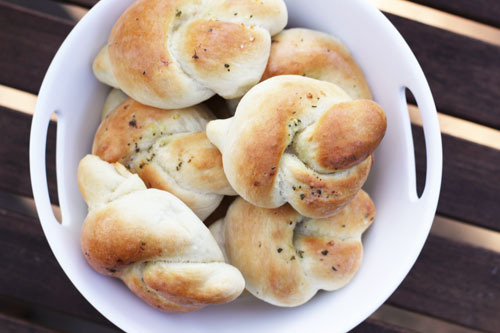 So, here’s the deal, if a restaurant has garlic knots on the menu, I am ALL IN. Surprisingly, I have never tried to make them at home. I know. SHOCKING. Until now, that is. Sunday was the day! 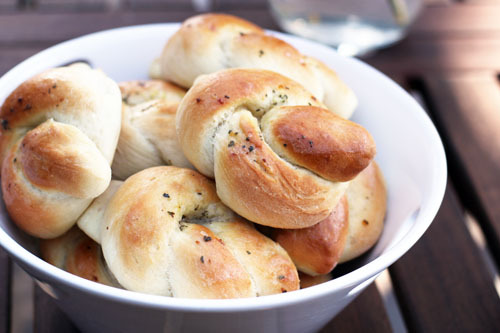 I used a breadstick recipe from the Food Network as my starting point and the garlic knots came out AWESOME. Against all odds. No, seriously. There were a lot of odds. First, I decided to half the recipe, but didn’t halve the amount of water, so ended up having to add in ingredients after it had already been kneading for a little while and I wasn’t entirely sure how much flour was already in there. Then I let the garlic knots rise for WAY TOO LONG. Just more poor planning on my part. Lastly, I pulled a ridiculously rookie baking mistake…I put both pans in the oven at the same time. The top rack of garlic knots were browning on top but doughy on the bottom, and the bottom rack of garlic knots were totally white on top. I snagged the pan on the top rack, threw it in my toaster oven and hoped for the best. Amazingly, BOTH trays of garlic knots cooked perfectly. It’s like the garlic knot gods were intervening for me. Thank you, garlic knot gods. I owe ya one. Place ¼ cup warm water in the bowl of a mixer. Sprinkle in the yeast and let sit for about five minutes, until foamy. Add the flour, 2 tablespoons softened butter, sugar, fine salt and warm water. Mix with paddle attachment until a slightly sticky dough forms, 5 minutes. Dump dough out onto floured surface and form a round ball. Cut ball into four pieces. Make each piece a nice round ball and then cut each of those into four pieces, leaving you with 16 uniformly-sized balls of dough. Roll each piece out like a snake, about 9-12 inches long. Tie into a knot and place on a cookie sheet lined with parchment paper or a Silpat, about 2 inches apart. Cover with a clean cloth and let rise until almost doubled, 45 minutes. Preheat oven to 400 degrees F. Mix melted butter, salt, garlic and oregano together. Brush over the top of the rolls, making sure you get a lot of the good stuff right in the middle of the knot. Bake until golden, about 15 minutes. When you take them out of the oven, brush with 1 more tablespoon of melted butter just for extra butteriness. 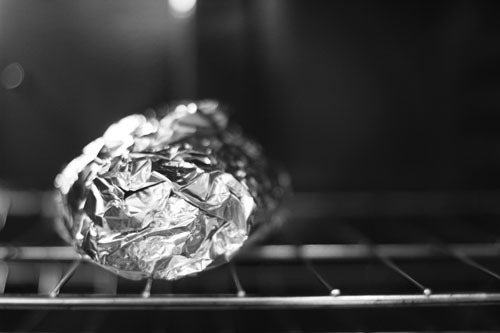 We reheated the leftovers the next day in our toaster oven at 325 degrees for about 8 minutes, wrapped in foil. I uncovered the knots with about 3 minutes left and they were perfect!